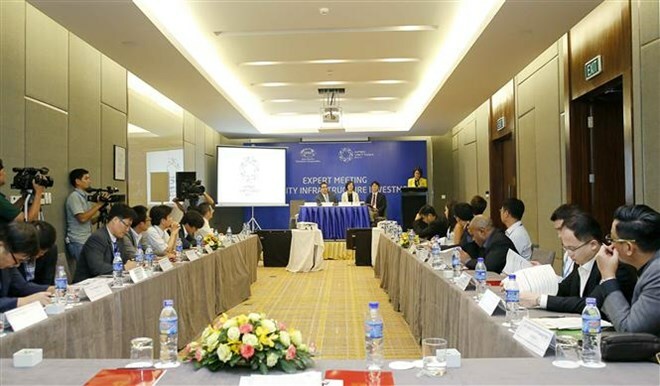 HCM City (VNA) – Well-designed, sustainable and resilient infrastructure will enhance economic growth, boost productivity and provide significant positive flow-on effectives, heard a meeting of the APEC Committee on Trade and Investment (CTI) in Ho Chi Minh City on August 19. The CTI Expert Meeting on Quality Infrastructure Investment was held within the framework of the third APEC Officials Meeting (SOM 3), where APEC member economies shared good practices and lessons learned in infrastructure projects. The event aims to enhance understanding on quality infrastructure investment from both institutional and technical perspectives among high-ranking officials in charge of infrastructure. Delegates shared the views that quality infrastructure investment helps ensure the governance of the infrastructure, reliable operation during the life span of a project, safety and resilience against natural disasters, terrorism and cyber attack risks. Kazuko Ishigaki, from Japan’s Ministry of Land, Infrastructure, Transport and Tourism, cited an estimate by the Organisation for Economic Cooperation and Development (OECD) in 2011 that the world needs 2.3 trillion USD per year for infrastructure investment. The Asian Development Bank (ADB) recent estimates show that Asia needs 1.7 trillion USD each year for infrastructure development, she said, stressing that APEC has promoted Connectivity Blueprint for 2015-2025 and related initiatives to boost infrastructure development. Kazuko Ishigaki told Vietnam News Agency reporters that like other countries, Vietnam should invest in infrastructure in a smart and effective way, explaining that fragile infrastructure will be easy to be damaged by natural disasters like floods and earthquakes. “It is important to design infrastructure in an effective way so that we don’t waste any investment in infrastructure,” she said. Nguyen Thanh Son, from the International Cooperation Department under the Ministry of Construction, said that with an annual growth rate of more than 6 percent, Vietnam has poured a lot of investment in infrastructure to attract more foreign investors.